This program will become a reliable assistant for you, if your business is connected with advertising space lease. The system suits both for advertising places on your web-site and advertising boards in your private garden. 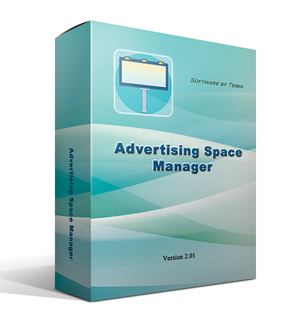 To start working, you should add all your advertising places to the program. You can set all necessary information about them, such as category, sub-category, type, description, additional information as well as, if required, to add pictures or files of any formats. For each advertising space you can indicate own rice category that is cost of lease per hour, day, week or month. In the program you can also keep a database of your customers – individual persons or legal entities. You can issue invoices to your customers sending them for printing or saving in PDF. The main function of the program is contract accounting. 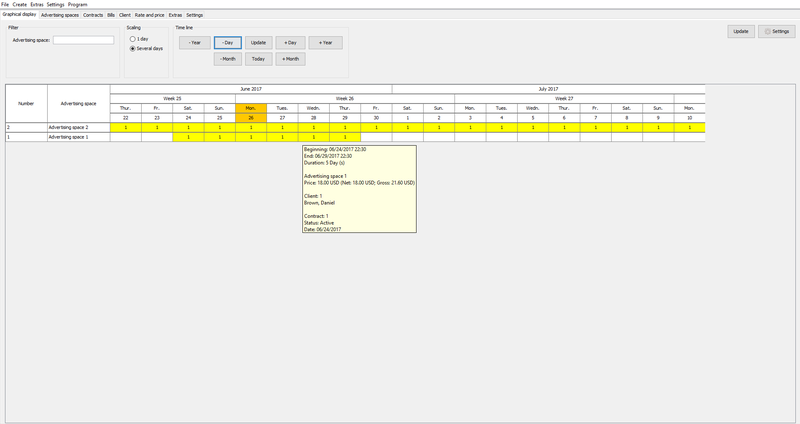 When creating a new contract, you can indicate customer’s data, contract date, its duration as well as accounting period. Then you can add to the contract advertising spaces with indication of price which will be automatically calculated on the basis of preset accounting period and price category of advertising space. You can also add to the contract additional services from the service catalogue. 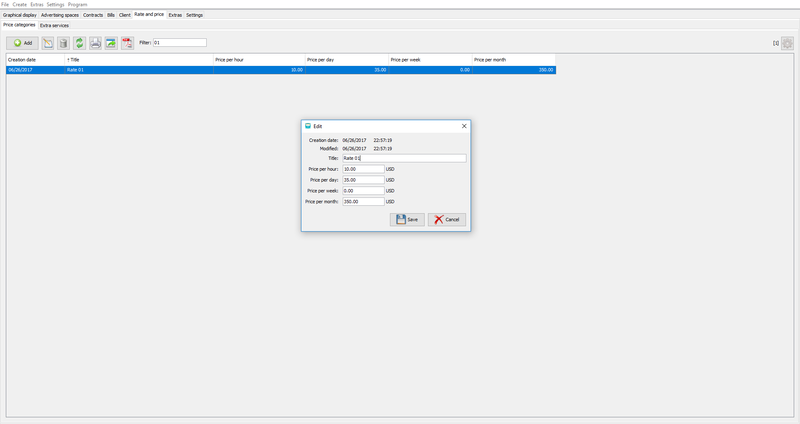 It’s very easy to create invoices in the program. 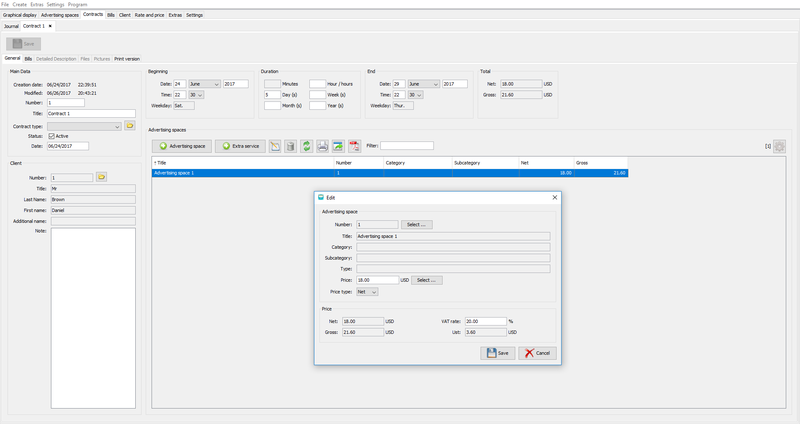 The system has two variants of creating invoices. 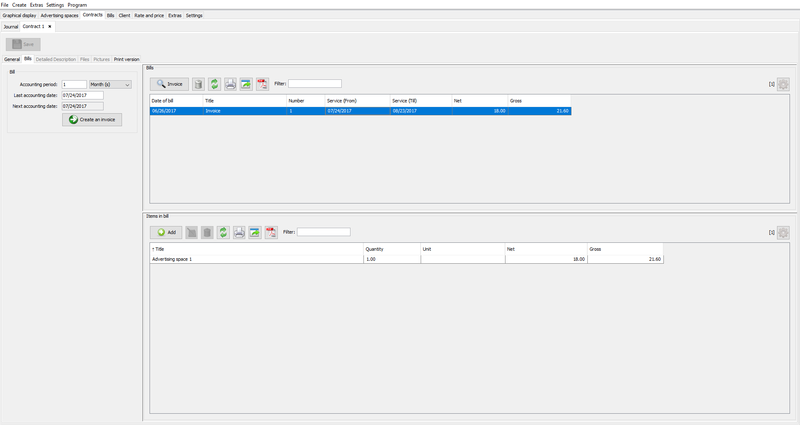 The first: invoices can be created in the tab “invoices”, clicking “add”, selecting customer and adding position invoice. The second variant: invoice can be regenerated on the basis of contracts. Each contract may have date of the last issued invoice and accounting period. These data can be found, opening contract and finding the tab “invoices”. Clicking “create an invoice”, invoice will be automatically created, herewith contract items will be added to the account. Date of the last invoice will be updated. For your convenience the program has available graphic calendar, where all your advertising spaces are indicated and contracts for one selected day or several days are shown. You can easily add a new contract clicking on the graphic calendar, herewith the advertising space and date of lease will be automatically copied. 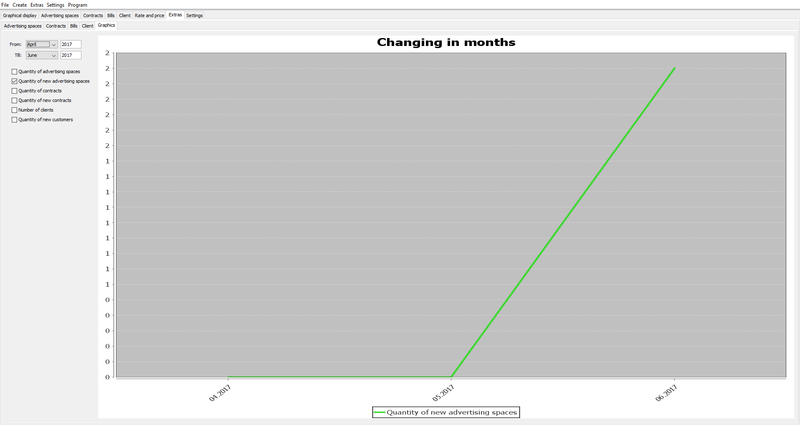 The program also has graphic statistics and import function of advertising spaces and customer data from CSV.